TAMPA, FL--(Marketwire - Oct 26, 2012) - Having to spend time away from home for work isn't easy, but throw in some sunshine and nearby beaches, and overtime doesn't sound so bad. Whether you're looking to host a corporate retreat or meet with local clients, the Tampa Airport Marriott has the event venue in Tampa for you -- and an offer to sweeten the deal. With the hotel deal in Tampa at this airport hotel, meeting planners and attendees will enjoy a number of perks, starting with group rates as low as $89 a night. When you book the meeting offer by May 31, 2013, you'll also get free self-parking, free shuttle services and free guestroom Internet. 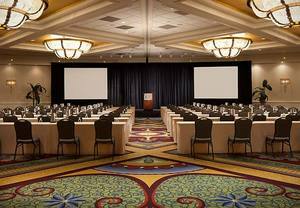 Plus, the bigger the meeting the bigger the benefits at this hotel near Tampa cruise port. Based on your room bookings, you can choose from a number of concessions that include a 2% credit to the master account, one complimentary room for every 35, double Marriott Rewards® points, a free one-hour opening night reception with light hors d'oeuvres, free wine with your catered dinner, free continental breakfast when you book a catered dinner, a 10% catering menu discount, a 10% audiovisual discount and a complimentary meeting room Internet connection. The number of concessions you receive depends on the size of your event. Book 15 to 50 rooms and receive two concessions; book 51 to 75 and get three; book 76 to 100 and get four and book 101 or more to choose five. After a recent $9-million renovation, the Tampa Airport Marriott is the ideal destination for business travelers and corporate events, with direct indoor access to Tampa Airport (TPA) and guestrooms with all the amenities a working guest could want, whether on the clock or relaxing. With triple-pane windows and plush bedding, guestrooms are the perfect escape at the end of a long day. Decor is inspired by nature, with a palette of refreshing mint green and warm chocolate brown and burgundy, and rooms are outfitted with 37-inch LCD HDTVs, locally inspired art work, improved lighting and functional and spacious bathrooms with plenty of shelves and storage. King rooms offer walk-in showers and sleeper-sofas, while concierge-level rooms include access to the private lounge. The lounge was recently transformed with everything from new carpet to new wallpaper, and guests can enjoy enhanced connectivity, flexible seating areas and computer and printer access. For more information on Tampa event planning using this special meeting offer, visit www.tampaairportmeetings.com. After a recent $9-million renovation, the AAA Three-Diamond Tampa Airport Marriott is the best choice for those headed to this sunny Florida city. Located within the Tampa Airport (TPA) and just a short indoor walk from the front desk to your flight, this hotel is among Marriott's top 10 hotels for guest satisfaction, offering an array of amenities and services that are often overlooked in airport hotels. After a long flight relax at the outdoor heated pool and hot tub, or stretch your muscles at the onsite fitness center. If you're ready to hit the road, this hotel's location makes it easy to explore beaches, museums, nearby golf courses and shopping. Travel can work up an appetite, so you can step right off the plane and right to this hotel's Skyye Coffee Bar for Starbucks coffee and to-go sandwiches and snacks, or grab a casual breakfast or lunch at Café Elise. If you're ready to escape to your room, order room service and stretch your legs out in a completely renovated guestroom with a nature-inspired palette and organic elements. Each room features triple-paned windows, a 37-inch HD LCD TV, spacious work desk, high-speed wireless Internet, locally inspired art work and Marriott's signature Revive bedding package. Enjoy lounge access and additional amenities with a concierge-level room. If you're here for work, this hotel is just minutes from the Westshore business district and has a number of corporate-friendly amenities including 18,000 sq. ft. of meeting and event space, a sophisticated spot for drinks and appetizers with clients at the Skyye Lobby Bar and the perfect place for a client dinner at the revolving rooftop View at CK's, featuring sushi, steaks and seafood with amazing skyline views. Whether you're looking to host a corporate retreat or meet with local clients, the Tampa Airport Marriott has the event venue in Tampa for you -- and an offer to sweeten the deal.